4.4 out of 5 based on 211 bloggers and 91 commenters. Diary/Notebook is a free premium blogger template adapted from WordPress with 2 columns, right sidebar, rounded corners, social bookmarking icons and vintage style. 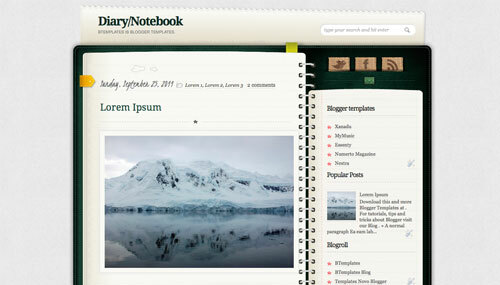 Excellent template for blogs about desktop, to write a diary or home and decoration. We use Facebook and Google+, not Twitter. Is there an icon available for Google+ or do I have to find my own icons and replace these? This is I am looking for. Thanks. the latest tweet part doesnt work.hellpP!! !how to fix it..?somebody. it’s very nice template, but i thought you should to create ads corner on the right top webpage display, overall it’s a great template that i ever seen. I encountered the same problem and solved it by placing “mailto:” in front of my email address. 2. how do I delete the latest tweets section? 3. how can I make the search bar work properly? Thanks for the template, I finally managed to insert it in my blog. I love this template BUT HOW DO YOU CHANGE THE FACEBOOK, TWITTER and RSS FEED links? Oh yes and can you add a NAVIGATION BAR that will allow you to EDIT from the Blog? I would like to know why the feature summary rack “read more” of this template is not working proplerly on my blog. Do you think you coulg give me a tip to sort that out? hi, how did you do it, please let me know. I am a little upset. first of all you never answer the queries I posted. What a shame! Second, now the Twitter feed (Latest Tweets) of this problematic template sundenly stopped working. I hope you to be kind enough to reply and, at least try give some help on this issue. Why can I not see the comments on the page? For some reason the sidebar content is showing up beneath the blog posts. The sidebar section is blank. I can’t figure out how to correct this. Help? Nevermind. I found an updated version that doesn’t have this issue. can we change te color of the note book? Thanks for your help and great job with the template! Where is the updated version without the issues? The sidebar doesn’t work. There is no way to arrange the widgets. how can I link the twitter box to my twitter account? i neeed this type of template ….. thnqqqqqqqqqqqq verrrrryy mucccchhhh…. how to change the twitter icon ? It’s Looking so Nice template…go To download now…i wanna Use this template..
How can I change the URL on Twitter,Facebook and RSS buttons?Please help me! Thoughtful article – I loved the info ! Does someone know where my assistant can get ahold of a sample a form document to work with ?